Mark Toomey (alto sax); Jeremy McMurray (piano); Pete Ayton (bass); and Paul Smith (drums). The opening number, an up-tempo blues written by Mark and titled Do You Have the Time? was followed by Brooks Bowman's East of the Sun (West of the Moon). A Night in Tunisia showcased the ability of the band to play exciting bebop. A repertoire to suit all tastes included Gershwin's Embraceable You; Miles Davis' Half Nelson; a beautiful version of All The Things You Are and, finishing the first set, a great rendition of Charlie Parker's Ornithology with fine solos by all. The second set included Star Eyes; Parker's My Little Suede Shoes; another of Mark's compositions - Song For Laura - a ballad he wrote for his daughter and played with sensitivity and great feeling. There was an interesting arrangement of the rarely heard, in jazz circles, 40's pop tune Be My Love, before (almost) finishing the night in style with Rollins' Tenor Madness which lead to the well-deserved encore - Out Of Nowhere. 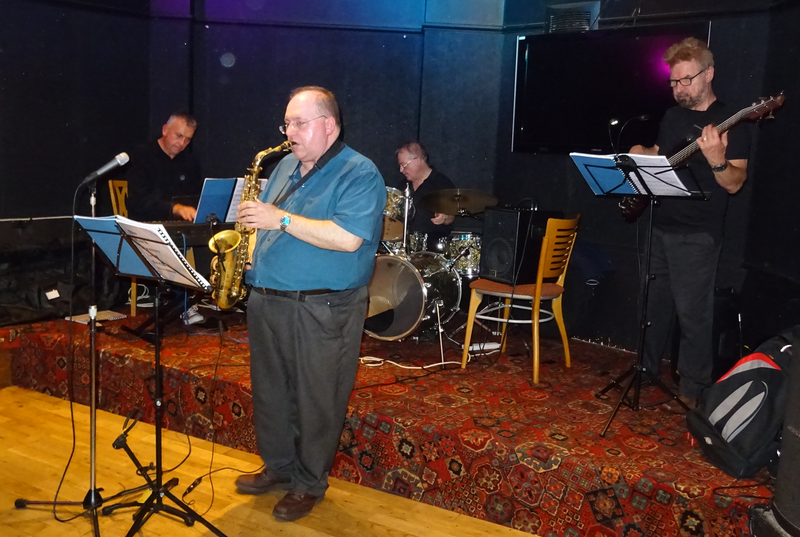 Once again the audience at Dormans Jazz Club were treated to a special night of music by four of the best jazz musicians in the area.